Welcome to the Sofia 2010 weblog. This weblog is maintained during the official EPMagazine meeting at Bucharest during 14 till 21 November 2010. We hope you’ll enjoy this weblog. You can click on some pictures! The 14th EPMeeting in Sofia was my first trip abroad. This was a challenge for me; everything I did was for the first time. It is surprising how different people, from different countries, with different cultures, with different ages are, at last, so similar. We were united by the same aims: build a better world knowing each other, learning how to respect different attitudes, way to have fun, to work, to live. Thanks to the teachers who organized the meeting even the most shy ones (like me) were encouraged to meet people of other countries. The last day started with little bit sadness on our faces because of having the last day in Sofia. After lunch, we all went to Natural Art and History Museum and saw too many images of the real nature covering animals, plants and woods. It was really fantastic and the whole Turkish group felt like as if everything was alive there. Moreover, we all learned the former name of Sofia as Serdica where all gladiators were fighting against wild animals. Then, we turned back to the hostel for dinner. As a closure of the meeting, last photos were taken and the programme was closed down by the speeches of participants. Sorry for being late with the report cause we had some bus problems on the road from Sofia to Kastamonu. Hope every participant turned back home safely. Today was the fifth day of the Meeting. The day started early workshop at the school laboratory and after two hours later, we had an early lunch with whole group. Then we were on the way to Borovits to see some beautiful nature lakes and river. To Halim, it was the most beautiful nature he has seen so far, and he added that everywhere was so clean and nobody was polluting the nature. After a while for coffee time, we all almost had 3 hours on the mountain. On the way to Sofia, we saw the mosque which is not actively used but instead as a museum and turned back to Sofia with full of oxygen. Everyone is so tired and fell asleep on the bus. Today has been a heavy day. We got up, as always, at 7.00 am and then we got to the bar where we got used to have breakfast. The schedule predicted to have lunch at 11.00 am in order to go to Borovitz. So it has been like I had breakfast two times. We got on the bus, and there I had an argument with my teacher, so we have been both upset each other for nearly the whole day. When we arrived we started walking to Borovitz and there we visited a museum, a little orthodox church and one of the oldest hydroelectric generator of the entire Bulgaria. All this until 4:30 pm. There I found a steak house so I strongly wished to have meal there. The group kindly waited for me, so I’ve eaten some roasted pork; it was really tasty. We got back to Sofia and there I’ve solved the argument with my teacher. I was angry with him but at the same time I was sad because he is a point of reference for me and I have lot of faith in him. This was the most important event this day. Now we are going out with the Romanian group; they are likeable and we talked a lot this day, especially with Marian and Robert. Heavy but positive day at the end. When day starts with a tasty breakfast, everything is ok! Today we visited a nice town called Borovitz. Before it we went around the mountain. We went there with a bus and we stayed in it lot of time. Sit there I looked the way and the mountains; it was fantastic. In my opinion Sofia is a magic city because I love its panorama that gives me some quiet and when I see it I dream. After more than one hour, we saw a fantastic mountain landscape with more trees and with a little nice river. For me it was a fantastic experience because in that moment I was very happy and I was in peace with the world. After this magic moment we went to Borovitz and there we had a good lunch in a nice restaurant. After that we visit a mosque which is very beautiful but, unfortunately we can’t enter in it. At the end on the day we came back to school and we had lunch at school. This day for me was very interesting and important because today I think about all my life and at what I did until now and I decided that I want to visit more cities because is a fantastic experience that helps so much us to became adult. Today was a fantastic day, we walked around the city and we visit some monuments. In the morning I had breakfast in a nice bar where I ate a cake and drank coffee, it was very sweet. After that we went to visit an observatory witch was very interesting, because I love so much the space, observe and study it. We observed the sun with a big telescope; in it there are some black spots. It has been fantastic! After the observatory we went to visit the city, we took some beautiful photo about the monument. In the afternoon we visited a museum about heart and men; in it there are some kind of mineral and stones, it was a fantastic and interesting experience. We decided to eat some sushi for dinner but unfortunately, we couldn`t go out because I was not very well, so we had dinner at school and after this I went to bed. The fourth day was really cold after a heavy rain last night. We made our first group activity to the observatory lab and the groups were having nice talks by walking through the awesome park full of leaves. The participants were so curious about telescope to see what is happening on the sun. The whole Turkish group and the others left the place with the feeling of nice experience. Sevda and Halim were so tired of taking pictures under the topic "natural life" in the garden. On the way to the school, the garden was still standing behind us with its nice view there. After the lunch, we had a nice trip to the museum "Earth and Man". Secil and Esra were so surprised at the stones there. They really would like to buy as a souvenir but they thought that it was be more expensive then they estimated. Then the most striking part of the day came and the participants started to explore the city and they finished the day with full packages of souvenirs. The third day started very early for us. natural life there. The old ladies were walking and we had a chance to talk them about the life in Sofia. As soon as we turned back to school, a fantastic music and dance show were performed for us by the hosting school Ivan Denkoglu Secondary School in sofia. Secil and Sevda were so surprised at watching the show of Michel Jackson...! Lunch and dinner were made of chicken. Talks by other groups were really interesting to listen to, especially the one by Christina. ... and the day was finishing with the rain outside. Today has been a day full of emotions. I’ve made the longest talk of my life, the most tiring talk ever made and probably the most important until now. I’ve been on the “scene” for more than an hour, trying to maintain high the attention of the present people and most important try to demonstrate my valor to university’s students and teacher. I’ve talked about the tasks to work on in the future. It’s the most important talk of the meeting so I had a great responsibility. I made my best, I already know that I didn’t the best but for me it’s ok ‘cause I’m only 15 so it’s ok for me. As said in the previous reports I’m really enjoying these moments and as all meetings I’ll take me for my whole life. It’s funny, strange, useful, interesting to talk to other people with different cultures and language than mine, and I’m also enjoying the important friendship that is getting strong in these days between our editorial boards. In the morning we arrived at school and we met our classmates from the other nations. Presentations about participating countries were made by students. Later we had lunch and then we played basketball with our friends from Turkey. Then all students discussed about common interests. During the afternoon we visited the Technical Museum of Sofia. It had many objects from the past, where you can learn about the History of Technology. After getting up at 8.30, we had breakfast at the hotel. Then we gathered at the school garden with the other participants. While we were waiting for the others, we played basketball with the boys of the Bulgarian school. Halim said that he started to become familiar to the project environment and had self-confidence. Sevda and Seçil are feeling very well because of nice conversations they had with Bulgarian and Greek teams. They hope to know Italian group better soon. Sevda said that the Italian Rossella is so close to them even in games & talks, and she really liked her warm attitude to them. To our group, meals and services are very well served. Esra fells so happy to see youngsters in a good-conversation and a very well manner. Today we had the most part of the talks in the afternoon. The talks were given by the students of Romanian Universities of Brasov and Bucharest, about the use of BioDiesel, History of Robots, Electricity with photovoltaic panels, New Trends of Brasov University. I really enjoyed the talk given by Horia Pop of Brasov’s University, I found it clearly but, most important, interesting. This has been a full day, full of emotion for all kinds. I enjoyed to talk, both yesterday and today, with Romanian student’s. They are friendly and nice and I’ve spent a great time with them. We talked about everything: motorbikes, school, engineering, but also every day’s life. Today is a beautiful day and I am very calm because after yesterday I know some new people who are very nice and now I talk so much with them. Today we stood at school for the conference that was very interesting, and after that we went out to visit the technological museum which was so beautiful and that was very useful for my learning at school. I hope that tomorrow will be as beautiful as today. We have been working on EPM magazine for a long time and we were waiting anxiously for this meeting in Sofia. 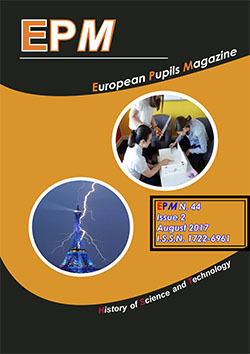 It is our first meeting with other partners working on EPMagazine. The first day, we visited Ivan Denkoglou School, where we met students from Italy, Turkey, Bulgaria and Romania. We shared our interests and we discussed for several subjects such as music, sports and other daily issues. We walked down the boulevard Vitosha and we took many photos. After nine hours we arrived Sofia. Then put the luggage to the hostel and began to explore the environment. After a while, we met Italian group and talked about the programme and the week. While Sevda was having her breakfast, she said she has not had such a breakfast before. Anyway she was learning a new culture. Halim was very enthusiastic about Sofia because this will be his first time out of Turkey and it was very interesting for him to see ladies who are blonde and he tried to contact with his new friends by making body movements. So everything was very all right for him so far. Like Halim, Secil was little bit amazed at hearing the wrong pronunciation of her name. She found Bulgarians so close and helpful to her and she said even if students come from different countries and have different ways of life, they are all one here for one aim. These were the first impressions of the day, to be continued. Today I’ve had a great time in Sofia! The fantastic thing is the calmness of this city, not so much cars, not so much people and everyone is silent, I love it! The EPMeeting is proceeding with some difficulties, Laura and Vittorio had their first talk. Laura was very shy so at the beginning she had some problems, but luckily she finally got used to talk to crowd. Same for Vittorio, but they are clever and opened to other cultures, so they now talk fluently to everybody. I just had 2 talks today. The public was pretty interested, especially the Brasov’s University’s student Horia Pop.